LOS ANGELES -- Two burglary suspects led authorities on a bizarre high-speed chase over multiple freeways and through the Hollywood area of Los Angeles Thursday afternoon. Authorities received a call regarding a burglary in Cerritos and cruisers began following a blue Mustang convertible. The suspects began driving erratically through South Los Angeles then traveled onto the northbound 110 and 101 freeways. 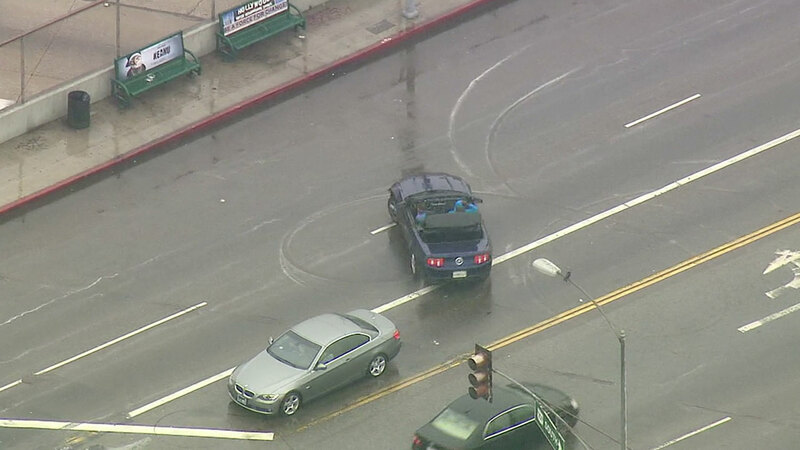 The driver, who at some point lowered the convertible top, exited Hollywood Boulevard and began spinning donuts with the car several times over both directions of the street. The driver drove through the area near the Hollywood Walk of Fame, waving and yelling at people walking around. Authorities tried to deploy a spike strip to stop the suspects and may have blew out the car's right front tire. The pair eventually got onto the southbound 101 Freeway where a TMZ tour bus driver tried to block their path. It appeared the driver threw something at the tour bus and was able to maneuver around the vehicle. The suspects headed into downtown Los Angeles, traveling through Figueroa Street. The driver stopped, taking a few minutes to talk to a police officer picking up a spike strip that failed to stop the duo. Once in South Los Angeles, the pair stopped in front of a home in a neighborhood. The car, damaged and with a flat tire, remained in the middle of the street as the driver exited the car and casually sat on the hood. He and his passenger then began greeting and hugging friends who stepped out of the home and appeared to be handing them items before police arrived to detain them. A crowd quickly gathered at the scene as the two men and another person were placed in handcuffs.